Fewer technologies have done more for marketing than e-mail. It’s fast, inexpensive, and delivers a lot of data to pour over. When you use e-mail marketing to send out e-mail surveys or you place a poll right on your Website, you’re doing more than bypassing the usual mail or telephone survey. You’re saving money, connecting with your recipients, and showing all your permission-based subscribers that you truly care what they think. The A L R program not only helps you create a great survey; we also help you distribute it! Emailing your surveys through your A L R can increase your e-mail deliverability. Our Spam Score Tool looks for key spam indicators within your e-mail and gives you a probability score of being filtered. Everyone needs a friendly reminder sometimes, including your respondents. Use our Automatic Email Reminder feature to remind your respondents and help you get more responses. Each time you send an e-mail poll, your customers see it as a fresh opportunity to give you feedback on your products and services. You can send different e-mail polls to different recipients, depending on their needs and interests. The more people that answer your questions, the better the chance you’ll be seen as a good e-mail marketer by e-mail service providers. You can leave your poll up as long as you want without fear of it disappearing on the second page of e-mail messages. If you’re not sure whether you want to send out a survey or put one on your Web site, why not do both? View both sets of results in real time, but use your web site to gather more e-mail subscriptions. There is a certain science to polling your customers via e-mail or the Web. Your best possible option for gathering great data is to keep your surveys as short as you possibly can. If you have, say, 20 questions you want to ask your customers, and you plan on sending your survey via e-mail, it’s a good idea to divide those questions up in three or four parts, spread out over weeks or even months. When it comes to the Web, you have more freedom. You can divide your survey up into two parts, or simply use an incentive to encourage more people to finish. The biggest survey data killer is time. No one wants to start an open-ended survey, spread across five or six Web pages, that may take as little as five minutes or as long as an hour to finish. Promote your survey as being quick and easy. If you’ve taken your survey and found that it takes only three minutes to finish it, max, then say that. Also, let customers know ahead of time how many questions they’ll be expected to answer. If a client goes in knowing that they’ll be at their computer answering 20 questions, that’s okay. They’ll take comfort in knowing you told them ahead of time. Although we’d all like to see the human race as inherently selfless, let’s face it: people often do things when there’s something in it for them. Surveys and polling are no different in this respect. Offer your customers something of value in return for their time. This can be a deep discount, a white paper, a special how-to guide, or anything else you can think of. The key to your dangling carrot is value. If your customers can go through your site and find a 10% off coupon with ease, offer them an addition 10% on top of that so they can save a total of 20%. Multiple choice and true false questions are great when it comes to surveying clients. 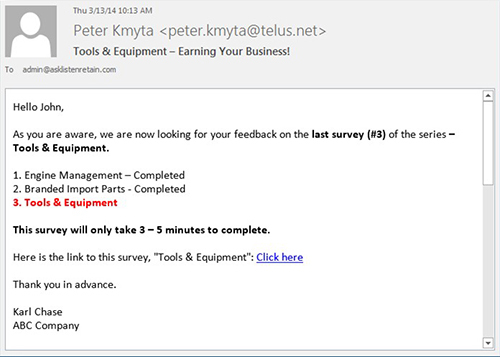 With them, customers can literally answer an entire survey with just simple clicks of a mouse. However, some customers may feel the need to expand upon their answers, dropping some great data in the meantime. Don’t cut off this customer need. Add a space after each question, true or false, multiple choice or otherwise, where they can type in an expanded answer. Let’s be honest here. What customer doesn’t like to be thanked for taking the time to do something? It’s a small gesture, yes, but it gives the customer a sense of satisfaction that you’re not taking them for granted. Add a gracious thank you message at the very end of each survey, telling your customers that not only are you extremely happy and thankful that they took the time to complete your e-mail or Web survey, but that you look forward to seeing their answers because you know that they’ll help you make things better on your end. One of the biggest challenges in e-mail marketing or any ad medium for that matter, is getting clients truly involved in the process. With a message at the end of your e-mail or Web survey that tells customers just how valuable their data is to you, you’re ultimately showing them that they’re helping you shape how things will be run in the future. This makes each and every customer feel good about their contribution, that they’re a part of something bigger, and you’ll do well if you follow this tip and give them a stake in the process. Email and Web polls are cheap, easy to create and gather tons of data to help you shape your business. If you’re not already polling your customers and evolving based on the data, now is a great time to get started.